A PTA region is the focal point for leadership education, training, networking, service and coordination of all PTA units and councils within that area. 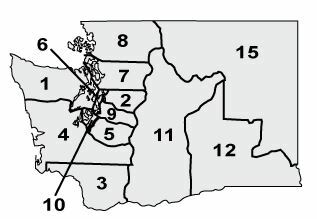 WSPTA’s Region 6 covers portions of King and Snohomish Counties. It is comprised of Northshore, Seattle, Shoreline and Vashon Island School Districts. There are over 120 PTA/PTSA units in Region 6. The Region 6 Director position is currently open. The acting Region 6 Director is Monika Scotti and she leads a Service Delivery Team that includes several of your Northshore Council PTSA leaders. Region 6 is here to assist your PTA with whatever needs you have from training to conflict mediation to procedural questions, ideas, advice and more. The Region 6 roster and contacts can be found at the bottom of this page. Visit WSPTA's Region 6 page for more information. Stay Informed by liking Washington State PTA - Region 6 on Facebook.